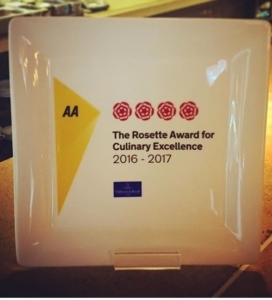 We are very pleased to announce that we have again retained our two AA Rosettes for the 2017 restaurant guide. This award is testament to the continued efforts of the whole team and reflects the hard work and dedication put in by every single member of staff. This was not the only good news released in the guide, as our Chef Patron, Aiden received the elite honour of four AA rosettes with his team at Manchester House, so a huge congratulations to all of you for this remarkable achievement.